Widely known as the “Hanoi Hilton”, a nickname used by Americans during the Vietnam War, Hoa Lo Prison was originally built by the French colonial government in 1896 in order to hold political prisoners. Many Vietnamese revolutionaries were incarcerated there, including the famous Phan Boi Chau and five future general secretaries of the Communist Part . Hoa Lo. “Furnace”. “Hell hole”. These names originated in the pre-colonial era, coming from the adjacent street, where wood and coal stoves were sold. During French Indochina, however, the French simply called it “Maison Centrale” (Central House). 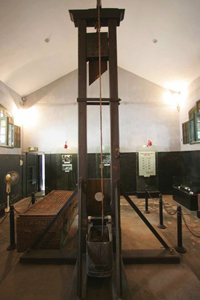 Built near the French Quarter of Hanoi, it was specifically designed to hold Vietnamese political prisoners, though common law prisoners were also incarcerated there. With a capacity of 600 seats in 1913, it was completely overcrowded (with 730 prisoners in 1916, 895 in 1922, 1,430 in 1933 and 2,000 in 1954), and the conditions of detention were particularly inhumane. The museum depicts tiny cells and a collective enclosure where the prisoners were chained to each other. Various historical French documents have been exposed that illustrate the problem of overpopulation and sanctions. The tour also provides more information on the various escape attempts, some of which were successful attempts that lighten the dark history of this prison. Preserved from destruction during the Japanese occupation in 1947, the various reports on these escapes are a rich source of information about the inner workings of the colonial administration at the time. We learn that between the 1910s and 1930s, hawkers had made a profession of transmitting messages through the bars of the prison. Conversely, for a fee, they would sometimes throw tobacco, letters or packages through the prison bars. 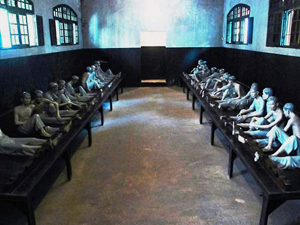 The prison itself was a laboratory of political ideas; many future leading figures of the Vietnam Communist Party developed in the “Central House” in the 1930s and 1940s. After the French defeat at Dien Bien Phu and the Geneva Accords of 1954, the prison came under the authority of the Democratic Republic of Vietnam. Between 1964 and 1973, the prison held inmates including several American pilots captured by the North Vietnamese - among which, were the future Senator, John McCain, and Pete Peterson, who, in 1997, became the first American Ambassador in the Socialist Republic of Viet Nam. In 1996, most of the prison was demolished to make way for towers. The southernmost corner however, was preserved and opened to the public in memory of Vietnamese revolutionaries who died there. Address: 1 Hoa Lo, Hoan Kiem District , Hanoi Opening hours: 8am- 11.30am and 13.30pm-16.30pm from Tuesday to Sunday. Closed on Mondays. Rising in the middle of China town, Luong Nhu Hoc street has been bustling these days with colorful lanterns hanging in front of several stores throughout many tiny valleys within the neighborhood. Not knowing when, the street has been an indispensable part of Tet Trung Thu (Mid-autumn festival) for Saigonese besides festive events in town. Just 300 meters long, it has displayed all shapes of lanterns with blazing lights of hundreds of neon lights, candles and winking LEDs from battery-run toys. There are probably a lot of places for buying lanterns, but elbowing others out in a crowd to get the best lantern for their kids has become an interesting activity to many young fathers and brothers on this street. Couples are also finding this occasion as a chance to take picture together. Local insight: don’t spend too much time taking picture in front of a certain store because you are disturbing their business. Known as the cradle of Vietnamese culture, Hanoi has much more to let the world know how traditionally Hanoian celebrate the festival. At weekend on the occasion of Tet Trung Thu, people from everywhere rush to Hang Ma street to buy lanterns, take pictures and enjoy the art of “tò he” (knewding colored dough into paste animals). Although it costs only 10,000VND for each, “tò he” has been losing its position to other modern toys from China which is worth 10 times of its cost. Around 30 years ago in Hanoi city, “tàu sắt tây” (a ship made of steel) was once a most popular toy for Hanoian kids. 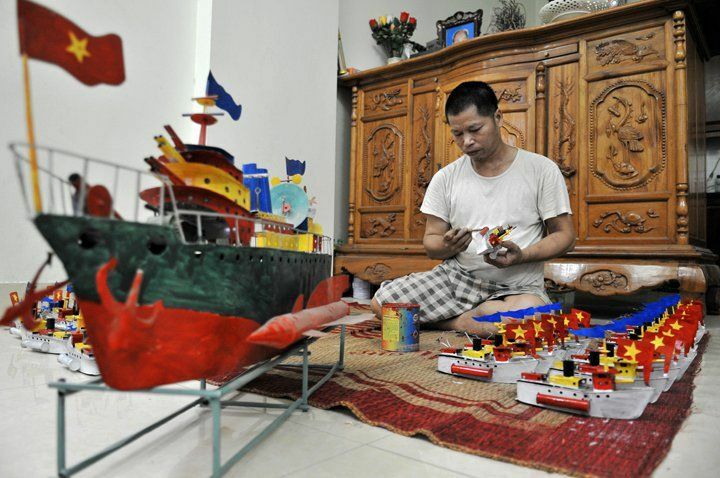 By using milk cans, waste bronze and paints, craftsman created moveable ships to thrill them during Tet Trung Thu. The ship has a boiler inside, which is burnt, will transfer the heat to a small pipe. Then, the pipe makes water hotter and hotter until creating pressure to make the ship move. While most of vendors find them unprofitable to promote in their store, a few individuals are enthuasiastic to keep them alive. Local insight: if you are trying to see these 2 special toys, keep an eye on every corner of the Hang Ma street for “tò he” or head up to Hang Thiec street to grab “tàu sắt tây”. Be patient since you might spend a whole day to look for them. Lanterns during this occasion will be very expensive and different from stores to stores, types to types. 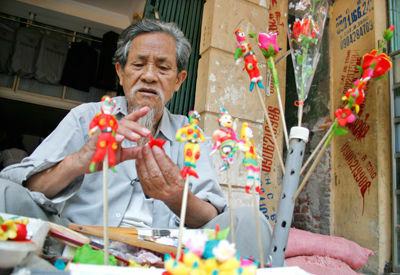 It you are into the spirit of Tet Trung Thu, you can spend less than 100.000VND for a lantern. We suggested that you visit couple of stores before paying for your favorite one. The price of the ship fall in the range of VND 250,000 – 350,000, lots of travelers buy them from the store #33 Hang Thiec street. Never ever bargain on these days! Hanoi’s Snake Village of Le Mat The villagers of Le Mat, just 7 km northeast of central Hanoi, welcome many curious travellers craving a different type of lunch, namely, one of snake meat. Surely a dining experience that cannot be filed under ‘blasé’. The restaurant’s owner is a man of few words and many scars. Indeed, his arms are covered with wounds, ugly souvenirs from the slithering reptiles with whom he shares a roof. Says the snake wrangler: "I have been handling snakes since I was a child. A bite from one of our snakes is very painful, yes, but not fatal. There is no venom. The first thing we do is extract the venom from the snake." Most of the snakes are cobras, arranged in securely closed boxes. Some of them are quite large. 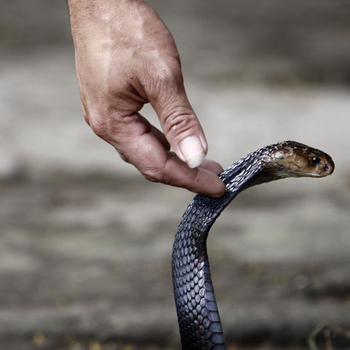 In Vietnam a snake dinner is considered a ‘man’s dish’ and thought to promote strength and virility. After I choose a scaly specimen it is im/mediately sliced open and its blood collected for drinking. Minutes later a waiter arrives carrying two glasses: one filled with the snake’s blood, the other with a fluorescent green liquid, the bile. Both of these ‘beverages’ are cut with rice vodka. There is also a small dish containing the snake’s heart. Sensing my reservations, the owner grabs the glass of blood, plops in the still-beating heart and after a resounding chant of ‘Mot, hai, ba!’ (one, two, three), downs the explosive cocktail in a flash. After this initial ritual of chest-thumping machismo, the slaughtered snake (a relatively small one, incidentally) is taken into the kitchen. Here, chefs will turn nearly the entire reptile into numerous traditional dishes. Using a variety of seasonings and lots of lemongrass, the chefs turn out skewers, spring rolls, a salad, a soup and porridge. Even the skin is grilled. Although the taste of the snake meat itself is somewhat obscured by the sauces and complementary dishes, its texture is halfway between that of fish and red meat. Truly, snake meat is a unique Vietnamese speciality. 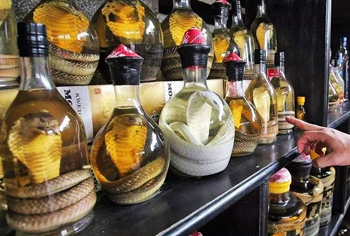 And should you recoil at the thought of eating snake, you may want to try a snake-infused digestif believed to carry aphrodisiac properties. Don’t worry: Venom is dissolved in the alcohol. 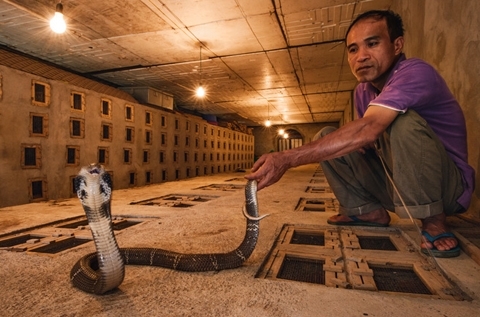 There are roughly 100 snake-farming households in Le Mat. These farms employ nearly 400 people. 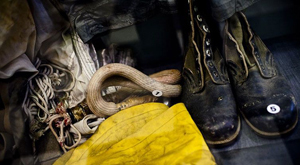 As well there are two large specialized farms that breed snakes and produce snake meat. Every day Le Mat receives around 1000 Vietnamese and foreign travellers looking to try this serpentine speciality. Hard to believe that not long ago the business of snake breeding and meat production almost disappeared. From the 1960s to 1990s snakes around Le Mat were bred for restaurants and pharmaceutical purposes. Then, in 1993, Vietnam ratified the international convention on the protection of wildlife and imposed restrictions on the snake-breeding industry. Snake meat disappeared from menus. In 2007, aware of the negative repercussions on the local dining economy, Vietnamese authorities granted Le Mat a ‘craft village’ status. On this basis plans for development were drawn to reconcile snake breeding and meat production with increasing tourists eager to sample this most unique Vietnamese dining experience. The easiest way to get to Le Mat Village is to jump on city Bus No. 10 to Long Bien Bus Station (VND3000/ticket). From Long Bien it’s only a few hundred metres to Le Mat. Allow 20-30 minutes for bus travel. 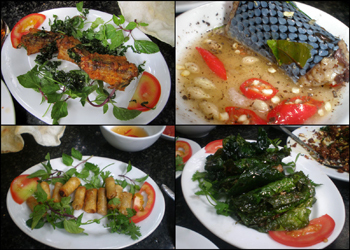 Snake is considered a luxury food in Vietnam. Plan to fork out between VND300,000-600,000 per person for a group of four. Am I boarding an airport bus in Ulan Bator or Vietnam’s capital? I can’t tell because every passenger is wearing scarves and mittens. It’s not Arctic cold, but I’ve just swooped in via the tropical bliss of Ho Chi Minh City wearing nothing but shorts and a t-shirt. Little wonder my tightly bundled fellow travellers smirk and my wife gives me that ‘I told you so’ look. Hanoi, chilly in January? Believe it. Just for kicks we fly to Hanoi on a budget carrier and board the airline’s shuttle to the Old Quarter. It costs VND 80,000 (about USD4), no hassles. A taxi ride would have cost nearly five times as much, maybe more – it’s largely dependant on one’s bargaining prowess. Interestingly, a competing airline’s shuttle tried to cajole us onto their bus: ‘Same thing, same ride’, said the clerk at the airport. Yeah, right! It’s a brisk 15-minute walk from the drop point to our hotel in the Old Quarter. When you visit Hanoi, stay in the Old Quarter. Consider it a strategic move that gives you access to most of the action. Our boutique digs, freshly built this year, are on Hang Be Street – The Street of Rafts, although today it’s more like the street of motorbike maniacs and pedestrians on autopilot. At our hotel they lay out the red carpet, for real: we arrive the night of an early New Year’s party and celebrations are in full swing. A warm crystal glass of mulled wine is thrust into my hands before I’m able to set down my Samsonite. Here comes the chardonnay and champagne! Then the hotel manager, all smiles up front and all business out back, introduces himself and beseeches Sue and I to ‘Come downstairs later and join the party.’ So we do – indeed we do! – and feast on fried fish, spring rolls, salads, fruit skewers and panna cotta. Best check-in ever. Our room is tiny, like a Barbie condo, but fresh and modern. There’s an LCD TV on the wall. Custom embroidered cushions and towels. Teak furniture, blackout curtains and a lacquered tissue box on the writing desk. Bathroom fittings are European standard. Our sole gripe is the lack of hot water, only available in 40-second bursts each half hour, which makes showering together not only romantic, but a necessity! Hoan Kiem Lake is the showpiece of Hanoi. Even with the winter wind whipping off its surface, chilling one’s beak, Hoan Kiem is a marvellous place for a stroll or some Chinese aerobics. Built on a small hump of earth on Hoan Kiem, Ngoc Son Temple is accessed via a flag-lined pedestrian bridge, the Huc. Pay VND20,000 (USD1) to cross, and then fight the crowds to get a look inside the temple, home to an enormous taxidermic turtle caught in the lake 45 years ago. Set in a lively lane off Phan Chu Trinh Street, Exchange Café serves up world-class cappuccinos and creamy, comforting soups. What the café lacks in central heating it makes up for with piping hot drinks and a cosy ambience, sort of like grandma’s place at Christmastime. Although a tad drafty, Exchange Café makes for a good pit stop near Hanoi Opera House. What’s better than authentic Italian food on New Year’s Eve? (In Vietnam no less!) Just a frankincense canister swing away from St. Joseph’s Cathedral, Mediterraneo Italian Restaurant stands on one of Hanoi’s most gorgeous streets, Nha Tho. As 2012 ticked over, Sue and I shared a della casa pizza, followed by tiramisu. I’m one cigar down and we’re off to the reflexologist for a much needed foot massage. The Revolution Museum is across the street from the Natural History Museum, though you wouldn’t know it because it’s well cloaked and there are no signs advertising the place. God’s honest truth, I stumbled in here by happy accident. 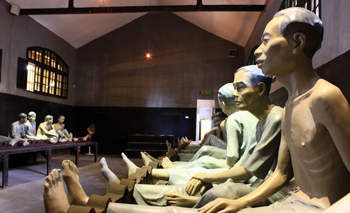 Inside, there are thousands of pieces of memorabilia that document Vietnam’s liberation movement from 1858 to today. Exhibits cover two floors, and yes, you begin your self-guided tour on the second floor – follow the wall signs. Admission is VND20,000 (USD1). No trip to Hanoi is complete without attending a water puppet performance at Thang Long Water Puppet Theatre. Made of lacquered wood, these colourful marionettes dance across a pool of shallow water and are manipulated by veiled puppeteers using underwater sorcery. The multi-act extravaganza presents a condensed version of Vietnam’s cultural history and folk tales. 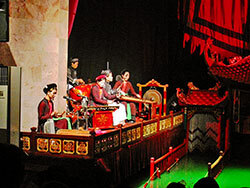 Live singing and musical accompaniment performed on traditional instruments enhances the experience. Show times vary and you’d be wise to buy tickets in advance as the shows are usually jam packed. In addition to an extensive menu of regional Vietnamese cuisine, Highway 4, under its Son Tinh brand, sells top-shelf liqueurs made from herbs and fruits. My nip of Passion Fruit arrives swiftly and goes down likewise. Although service is a little inattentive and our table spot draughty, the food is very good. Try the aubergine claypot even if you’re not vegetarian. Fly from Ho Chi Minh City to Hanoi daily on Vietnam Airlines, Vietjet Air and Jetstar Pacific. The One Pillar Pagoda, a historic Buddhist temple in Hanoi, has been recognised by the Asian Records Organisation as having the most unique architecture on the continent, the Vietnam Records Organisation said on October 17. Originally dubbed Dien Huu, which means long-lasting happiness and good luck, the pagoda was built in 1049 on the orders of King Ly Thai Tong. During the Ly Dynasty, to mark Vesak or Buddha’s birthday, it was the site where an annual royal ceremony to celebrate the event was held. Legend has it that Ly Thai Tong, who had no children, used to go to pagodas to pray to Buddha for a son. One night, he dreamt that he met Bodhisattva Avalokiteshvara, the Goddess of Mercy, sitting on a great lotus flower in a square-shaped pond and handed him a baby boy. Months later, when the Queen gave birth to a boy, the King was advised by a monk to erect a pillar in the middle of a lotus pond, similar to the one he had seen in his dream, in honour of the Goddess of Mercy. It was built of wood on a single stone pillar 1.25m in diameter, 4m high and resembled a lotus blossom, the Buddhist symbol of purity. With all its architectural and historical values, the pagoda was classified as a national historic site in 1962. On May 4, 2006, it was recorded in Vietnam ’s Guinness Book of Records as the pagoda with the most unique architecture in Vietnam. During its long history, the complex has undergone a number of renovations and has become one of the most interesting architectural complexes in Hanoi, attracting large numbers of domestic and overseas tourists alike. Vietnam's water puppets appeared in the Mekong Delta centuries before Jim Henson's remarkable, furry Muppets and beyond that, they walk on water! How's that for a public educational "field" production? I'd say that's -- legendary entertainment! The first time our family saw the water puppets in 2006, Claire was 5 and our newly adopted son, Peter, just 9 months. We were on our adoption journey to claim Peter and I recall being nervous about bringing such a young infant to a darkened theatre in the late afternoon, not wanting to ruin the show for other theatre goers. To my amazement, and relief, he was enthralled then, as now. 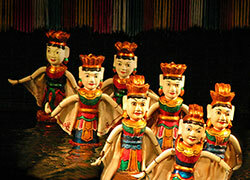 The water puppet tradition began as village story telling in the 11th century in the Mekong region where farmers and fishermen and women and their families told stories and entertained one another with puppets on the water. Now skilled puppeteers animate the dragons, phoenix, fairies, fishermen and villagers and other sacred creatures in fight scenes, dances, fishing expeditions and comedic sketches between husband and wife. Traditional musicians and singers help tell the stories through drumming, wind, percussion and vocal accompaniment. It's a stunning cultural presentation which, even today, entertains and delights and transmits the values of hard work, loyalty and family ties, and both celebrates good fortune and the reversals of fortune life brings us all. The Lotus Theatre Water Puppets are a cultural experience, found both in Ho Chi Minh City and Hanoi, not to be missed on your visit to Vietnam. The show runs in at under an hour, but its lessons may last a lifetime. Let's have a sneak peak at the show!